This continues a series on the best Yankees at different positions. Today: third base. When I ranked the Yankees’ best 50 starting pitchers, I decided that use of performance-enhancing drugs wouldn’t be a major factor. I would rank players based on their performance as Yankees, and if two players were even in that ranking, the player who wasn’t tainted by drug use would get the nod. But I wouldn’t totally discount a player based on PED use. So Roger Clemens ranked 16th among Yankee starters. I’m taking the same approach with position players. I love Graig Nettles and I don’t like Alex Rodriguez. But I’m ranking them by performance as Yankees. Each has played 11 years for the Yankees (Nettles played more games at third base, but A-Rod has played over 1,000 games there). Rodriguez has better Yankee stats in virtually every offensive category. He won two MVP awards as a Yankee, both at third, and Nettles’ best showing in MVP voting was fifth place in 1977. A-Rod’s a seven-time All-Star as a Yankee, Nettles five. As a Yankee, A-Rod led the league in homers twice, RBI once, runs scored twice, slugging three times and OPS once. Nettles led the league in homers once. A-Rod’s post-season hitting has been awful most of the time, but Nettles wasn’t a great post-season hitter most of the time either. 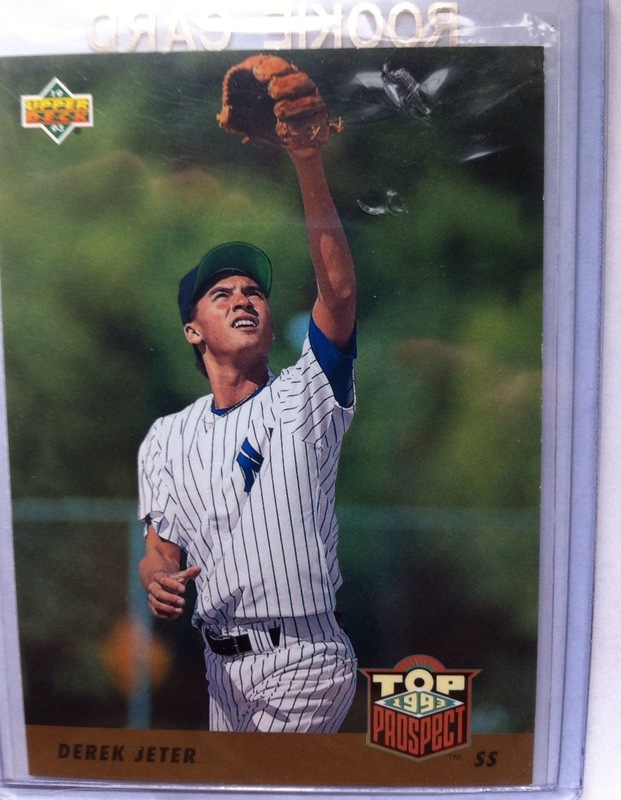 Nettles was a better fielder, but A-Rod has to rank first here. Of course Nettles ranks second. I’ve noted before that he belongs in the Hall of Fame. He would have a few more than his two Gold Gloves if he hadn’t had the misfortune to start playing when Brooks Robinson won that award every single year. Nettles’ Game Three defensive performance in the 1978 World Series was as good a post-season game as any fielder ever had. Despite overall weak hitting in the post-season, Nettles sizzled in the 1981 American League Championship Series, going 6-for-12 with 9 RBI in just three games and being named MVP. He was a defensive, offensive and leadership anchor for the Yankees’ 1976-81 run that included two world championships, two more A.L. championships and a fifth division title. He’s an easy choice for No. 2 here. And, if I were going to discount A-Rod’s achievements because he’s a drug cheat, I’d need to discount Nettles for loading his bat with Super Balls. Red Rolfe was an All-Star four of his 10 seasons (all with the Yankees), winning five World Series. He led the league with 213 hits, 139 runs and 46 doubles in 1939, his best season and the Yankees’ fourth straight as champions. He topped .300 four seasons as a Yankee and hit a solid .284 in six World Series, emerging as champions in five of them. The Yankees have done alright with Ivy League players. Lou Gehrig went to Columbia, Rolfe to Dartmouth. Rolfe also coached at Dartmouth and in the professional Basketball Association of America. He managed the Tigers for parts of three seasons (including a second-place finish behind the Yankees in 1950) and part of a fourth. Wade Boggs played his best years in Boston, but was an All-Star and .300 hitter the first four of his five seasons as a Yankee. The last of those four All-Star seasons, 1996, Boggs won his only world championship, celebrating on horseback. Scott Brosius gets the fifth spot on this list, based on four seasons that all ended in the World Series, three of them with victories and one with a Game-Seven, ninth-inning loss. He won an All-Star selection and a Gold Glove for the Yankees, and in the post-season he hit eight homers and drove in 30 runs. His two homers in Game Three of the 1998 World Series, including a three-run eighth-inning blast with the Yankees trailing 3-2, helped him win the World Series MVP. As I mentioned in my post on second basemen, Gil McDougald would rank ahead of some of these players on a list of all-time best Yankees. But he kept switching positions. 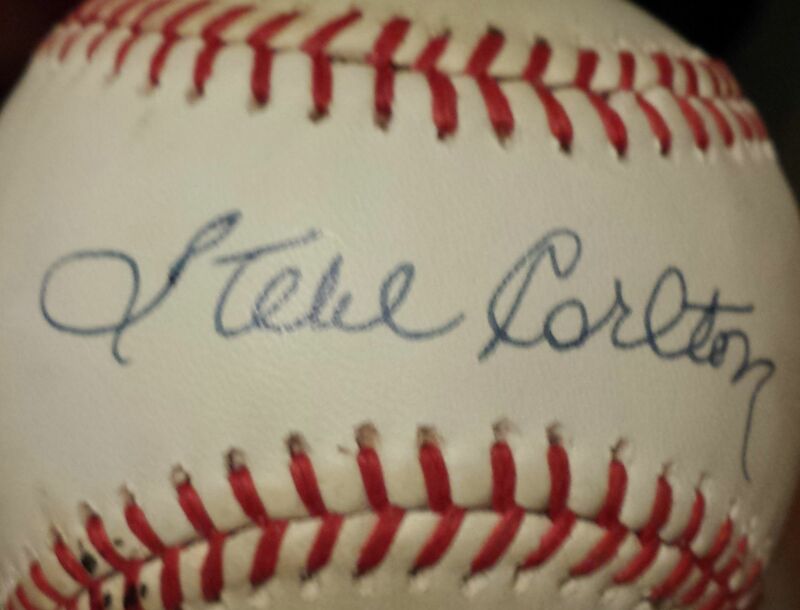 He was Rookie of the Year (in 1951) and an All-Star (in 1952) playing primarily at third. But he played more games at second (599) than at third (508). That’s almost as many games as Brosius played at third for the Yankees, but Brosius was better in the World Series, hitting .314 to just .237 for McDougald. Joe Sewell is actually in the Hall of Fame, but that’s primarily for his decade at shortstop for the Indians, not for his final three years, playing third base for the Yankees, 1931-33. The same is true of Wade Boggs (except that he stayed at third base), but he played longer for the Yankees and was stronger at that stage of his career than Sewell. Hall of Famer Frank “Home Run” Baker finished his career for the Yankees, after earning his Dead-Ball-Era nickname for the Philadelphia A’s, leading the league four straight years in homers, without ever hitting more than a dozen. He started only four years for the Yankees and, in an age of inflated batting stats, topped .300 only once for the Yankees. And he never led the league in any batting category for the Yankees. Robin Ventura played only one full season, 2002, with the Yankees, but he was an All-Star, hitting 27 homers and driving in 93 runs. I really liked Clete Boyer when I was young, and he’d have won some Gold Gloves except that he played third base in the American League in the era of Brooks Robinson (he did win one after being traded to the Braves). He played longer for the Yankees (eight years, seven as a starter) than Brosius or Boggs, but they were better hitters by far. Joe Dugan hit better than Boyer in his seven years with the 1920s Yankees, but I still rank Boggs and Brosius higher. It does seem odd not to have any Yankees from the 1920s, ’50s or ’60s on this list, but I think I have the right top 5. Aaron Boone had a better special moment than any Yankee third baseman, but didn’t even play a full season for the Yankees. And even in the post-season, he hit just .170. But one of those hits will live forever in Yankee fans’ memories. Which team has been best at third? We don’t have a clear winner for the team with the best tradition at third base. The Red Sox (Boggs and Jimmy Collins) and Orioles (Robinson and Cal Ripken Jr., who played 675 games at third) are the only teams that were the primary teams for two Hall of Fame third basemen. The Pirates have Hall of Famer Pie Traynor and Bill Madlock, a four-time batting champ. The Cubs had Hall of Famer Ron Santo and Madlock. The Braves had Hall of Famer Eddie Mathews, certain Hall of Famer Chipper Jones and MVPs Bob Elliott and Terry Pendleton. Without researching the other third basemen on any of these teams, I’d guess the Braves probably have the strongest tradition. But the Yankees are a contender and probably no worse than third or fourth. I explained my criteria in the post on first basemen, so if this seems familiar, it’s because I cut and pasted that explanation here, then adapted it for third basemen. If a player is in the Hall of Fame (Boggs), belongs there (Nettles) or would be a Hall of Famer if not for scandal (A-Rod), that carries considerable weight with me. Boggs, Sewell and Baker joined the Yankees late in their Hall of Fame careers, but only Boggs was still playing at a Hall of Fame level (if in a bit of decline). Sewell and Baker weren’t nearly as good in their Yankee years. If two players were dead even at a position for the Yankees, I would have moved the one with the better overall career ahead. I think Boggs was a bit ahead of Brosius as a Yankee, but his total career made that decision easier. I value both peak performance and longevity, but peak performance more. A-Rod’s MVP’s and league crowns helped secure the top spot on the list. I rank players primarily on their time with the team, but Rolfe is the only career Yankee on this list. Except if I needed a tie-breaker, I don’t count Boggs’ years with the Red Sox, Nettles’ with the Indians and Padres or A-Rod’s with the Mariners and Rangers. Post-season play and championship contributions matter a lot to me. All the contenders for the fifth spot contributed to multiple champions, but Brosius played the best in the World Series. A-Rod’s poor post-season play might have dropped him to second place if Nettles had been closer in regular-season offensive performance. Special moments matter, too. Nettles’ stellar defensive plays in the ’78 World Series and Brosius’ memorable 1998 homer helped seal their rankings. If Boone had played a few good years for the Yankees, his special moment would have pushed him onto the list. As I pondered the Hall of Fame prospects of young members of the Kansas City Royals 2015 World Series champions, I wondered how rare it would be for a world champion to have no Hall of Famers. While any young star faces long odds of reaching the Baseball Hall of Fame, quick research showed that a World Series winner without anyone making it to Cooperstown is also exceedingly rare. I just went back to 1947 in answering my question, because, as I noted in an October post, Hall of Fame standards were much lower before baseball integrated. So I will note year by year the starters and other important contributors of world champions who eventually became Hall of Famers. While I won’t speculate on whether players appeared bound for Cooperstown at the time (the point of yesterday’s post), I will note their ages at the time they won. If a player is in the Hall of Fame, but primarily for his play with another team, I will note that. Champion: New York Yankees. 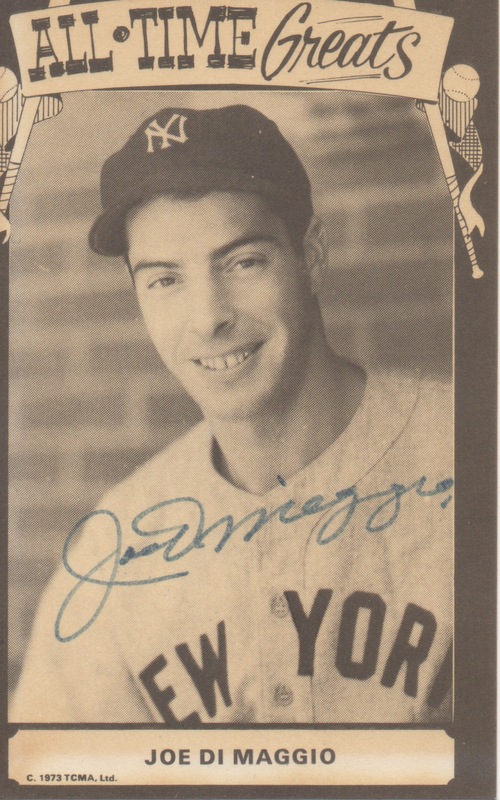 Hall of Famers: Yogi Berra, 22; Phil Rizzuto, 29; Joe DiMaggio, 32. Champion: Cleveland Indians. Hall of Famers: Larry Doby, 24; Bob Lemon, 27; Bob Feller, 29; Lou Boudreau, 30; Joe Gordon, 33. Champions: Yankees. Hall of Famers: Mickey Mantle, ’51-3, 19-21; Whitey Ford, ’50 and ’53, 21 and 24; Berra, all years, 24-28; Rizzuto, all years, 31-5; DiMaggio, ’49-’51, 34-6. Johnny Mize, a member of all five Yankee teams, was not a full-time starter most of these seasons. 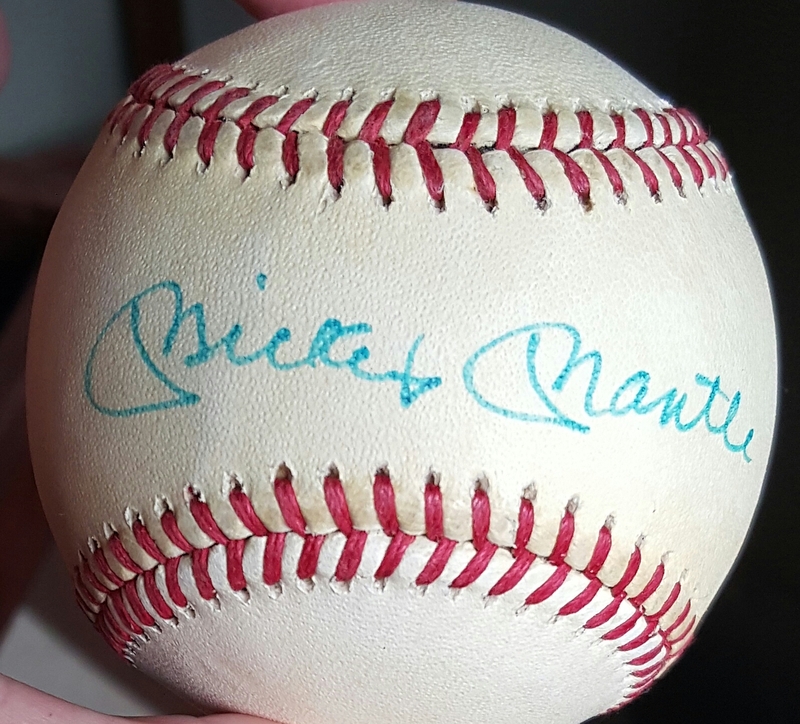 He joined the Yankees at age 36 and is in the Hall of Fame primarily for his slugging for the St. Louis Cardinals and New York Giants. Champion: New York Giants. Hall of Famers: Willie Mays, 23; Hoyt Wilhelm, 31; Monte Irvin, 35. Champion: Brooklyn Dodgers. Hall of Famers: Duke Snider, 28; Roy Campanella, 31; Jackie Robinson, 36; Pee Wee Reese, 36. Champion: Yankees. Hall of Famers: Mantle, 24; Ford, 27; Berra, 31. Rizzuto, 38, was a part-time player, as was Enos Slaughter, 40, elected to the Hall of Fame primarily as a St. Louis Cardinal. Champion: Milwaukee Braves. Hall of Famers: Hank Aaron, 23; Eddie Mathews, 25; Red Schoendienst, 34; Warren Spahn, 36. 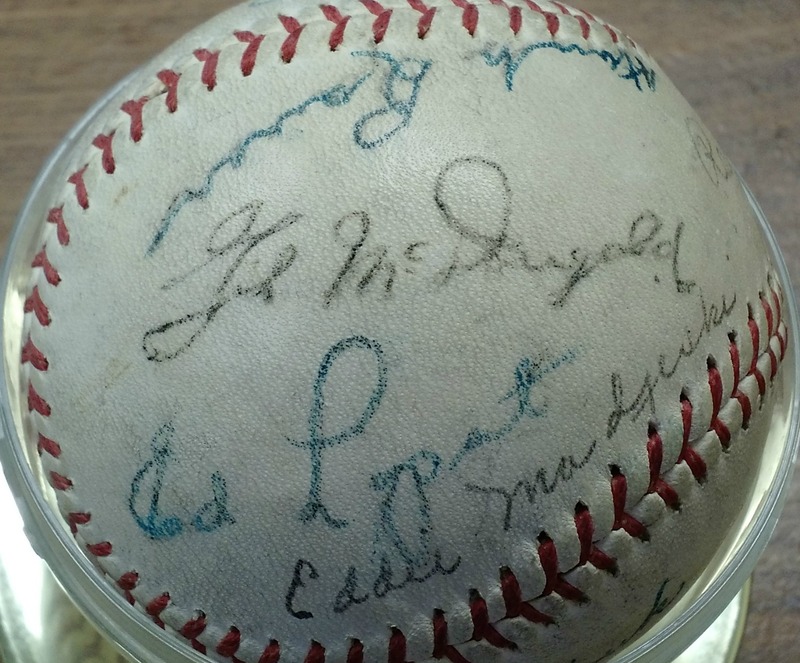 Whitey signed this ball “Ed. Ford” before his better-known nickname stuck. Champion: Yankees. Hall of Famers: Mantle, 26; Ford, 29; Berra, 33; Slaughter, 42. Champion: Los Angeles Dodgers. Hall of Famers: Don Drysdale, 22; Sandy Koufax, 23; Snider, 32. Champion: Pittsburgh Pirates. Hall of Famers: Bill Mazeroski, 23; Roberto Clemente, 25. Champions: Yankees. Hall of Famers: Mantle, 29-30; Ford, 32-3; Berra, 36-7. Champions: Dodgers. Hall of Famers: Drysdale, 26, and Koufax, 27. Champions: St. Louis Cardinals. Hall of Famers: Lou Brock, 25; Bob Gibson, 28. Champions: Dodgers. Hall of Famers: Drysdale, 28, and Koufax, 29. Champions: Baltimore Orioles. Hall of Famers: Jim Palmer, 20; Brooks Robinson, 29; Frank Robinson, 30, and Luis Aparicio, 32. 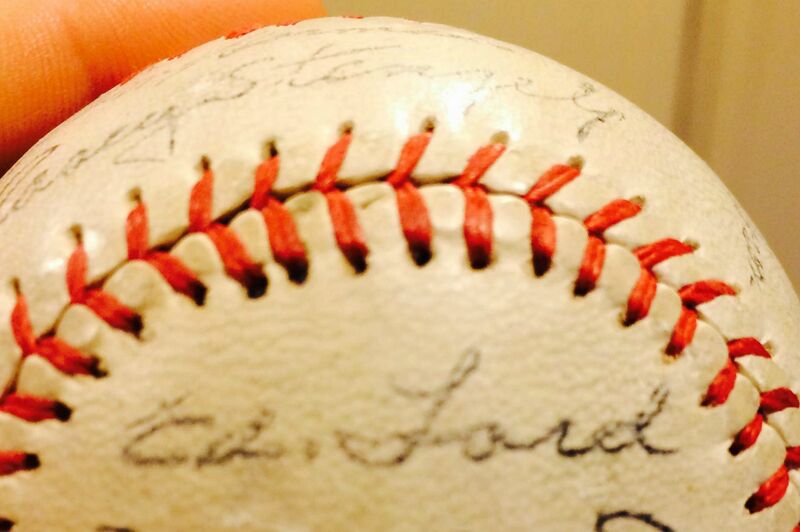 Bob Gibson’s autograph, with some Cardinal teammates, on a ball belonging to my son Joe. Champions: St. Louis Cardinals. Hall of Famers: Steve Carlton, 22; Brock, 28; Orlando Cepeda, 29; Gibson, 31. Champion: Detroit Tigers. Hall of Famers: Al Kaline, 32; and Mathews (a part-time player in his final year at age 36). Since yesterday’s post was about Hall of Fame projections, I should note here that 24-year-old Denny McLain, who won 31 games that year and won the Cy Young and MVP awards, looked like a lock for Cooperstown, but didn’t make it. Champion: New York Mets. Hall of Famers: Nolan Ryan, 22, and Tom Seaver, 24. Champion: Orioles. Hall of Famers: Palmer, 24, and the Robinsons, 33 and 34. Champion: Pirates. Hall of Famers: Willie Stargell, 31; Mazeroski (playing part-time at 34); Clemente, 36. Champions: Oakland A’s. Hall of Famers: Rollie Fingers, 25-7; Catfish Hunter, 26-8; Reggie Jackson, 26-8. I don’t count Cepeda, who had just three at-bats for the ’72 A’s and didn’t play in the post-season. Champions: Cincinnati Reds. Johnny Bench, 27-8; Joe Morgan, 31-2; Tony Pérez, 33-4. Pete Rose, 34-5, would be in the Hall of Fame, but he accepted a lifetime ban from baseball for betting on games. Champions: Yankees. Hall of Famers: Jackson and Hunter, both 31-2; and Goose Gossage, 26 (’78 only). Champions: Pirates. Hall of Famers: Bert Blyleven, 28, and Stargell, 39. Dave Parker of this team probably deserves mention with Denny McLain as a player who appeared on his way to the Hall of Fame. Cocaine use sidetracked Parker’s career. Champions: Philadelphia Phillies. Hall of Famers: Mike Schmidt, 30; Carlton, 35. Rose, 39, was also on this team. Champions: Dodgers. No Hall of Famers yet. Steve Garvey probably has the best shot of making it someday. Champions: Cardinals. Hall of Famers: Ozzie Smith, 27, and Bruce Sutter, 29. Champions: Orioles. Hall of Famers: Cal Ripken Jr., 22; Eddie Murray, 27; Palmer, pitching part-time at age 37. Champion: Tigers. No Hall of Famers yet. Jack Morris, 29, probably has the best shot. Champion: Kansas City Royals. Hall of Famer: George Brett, 32. Champion: Mets. 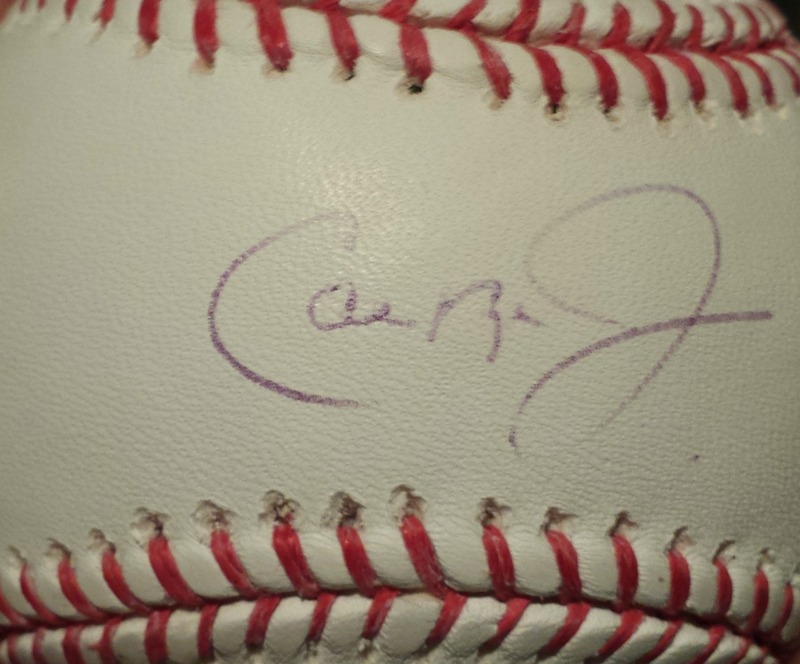 Hall of Famer: Gary Carter, 32. As noted in yesterday’s post, Dwight Gooden and Darryl Strawberry, 24, of this team appeared headed for the Hall of Fame before drug use stalled their careers. Champion: Minnesota Twins. Hall of Famer: Kirby Puckett, 27, and Blyleven, 36. Carlton, 42, pitched nine games for the Twins that year, but not in the post-season. Champion: Dodgers. Hall of Famer: Don Sutton, 43, was in his last year. He pitched only 16 games, none in the post-season. Of major contributors on this team, Orel Hershiser, 29, and Kirk Gibson, 31, may have the best shots at reaching Cooperstown someday. Champion: Oakland A’s. Hall of Famer: Rickey Henderson, 30, and Dennis Eckersley, 34. This is the first champion where performance-enhancing drugs are keeping a player out of the Hall of Fame (Mark McGwire, 25, for sure, possibly Jose Canseco, 24). Champion: Reds. Hall of Famer: Barry Larkin, 26. Champion: Twins. Hall of Famer: Puckett, 31. Champions: Toronto Blue Jays. Hall of Famers: Roberto Alomar, 24-5; Henderson, 34 (just on ’93 Jays); Paul Molitor, 36 (also just in ’93); Dave Winfield, 40 (only in ’92). Remember, baseball had no champion in ’94 because of a strike. Champions: Atlanta Braves. Hall of Famers: John Smoltz, 28; Greg Maddux and Tom Glavine, both 29. Chipper Jones, 24, appears to be a certain Hall of Famer, but retired in 2012, so he won’t be eligible for Hall of Fame consideration until the 2018 election. Champions: Yankees. Hall of Famer: Wade Boggs, 38. Derek Jeter, 22, and Mariano Rivera, 26, appear certain to reach Cooperstown when they become eligible for election: 2019 for Rivera and 2020 for Jeter. Andy Pettitte and Jorge Posada are less likely to make the Hall of Fame, and will be on the ballot in 2019 (Pettitte) and next year (Posada). Champion: Florida Marlins. No Hall of Famers. Gary Sheffield is another player whose Hall of Fame chances are hurt by PED use. Champions: Yankees. Again, Jeter, 24-6, and Rivera, 28-30, are certain Hall of Famers. Roger Clemens, 36-7, pitched for the ’99-2000 Yankees, but suspicion of PED use is keeping him out of Cooperstown. Tim Raines, 38, a ’98 Yankee, got 55 percent of the baseball writers’ vote last year and almost certainly will make the Hall of Fame someday, but mostly for his play for the Montreal Expos. Champion: Arizona Diamondbacks. Hall of Famer: Randy Johnson. Curt Schilling will certainly join him. He got 39 percent of the writers’ vote last year, his third year on the ballot. Champion: Anaheim Angels. No Hall of Famers and no likely prospects. Champion: Florida Marlins. Miguel Cabrera, 20, is a Triple-Crown winner and two-time MVP. He’s still playing and only 32 years old but certain to make the Hall of Fame if he stays free of scandal. Iván Rodríguez would be a certain Hall of Famer if not for allegations that he used PEDs. Champion: Boston Red Sox. Hall of Famer: Pedro Martínez, and Schilling will follow. David Ortiz, who’s still playing, would be an automatic selection if not for his failed drug test. Manny Ramírez won’t be on the Hall of Fame ballot until 2017, but drug issues are likely to keep him out of the Hall of Fame, too. Champion: Chicago White Sox. Hall of Famer: Frank Thomas, a part-time DH at 37. Champion: Cardinals. No Hall of Famers yet, but Albert Pujols, a three-time MVP, is a lock if he can avoid scandal. Champion: Red Sox. This seems a good place to stop this exercise. No star of the ’07 Red Sox, or any subsequent champion, is already in the Hall of Fame, and most aren’t even eligible yet. I’ve already addressed Schilling, Ortiz and Ramírez. While I projected the Hall of Fame chances of the 2015 Royals, I’m not interested in doing that for the young stars of other recent teams. Obviously, the numbers or Hall of Famers on some of these teams, especially the more recent ones, will grow, as Morris, Raines, Schilling and others eventually get elected. But already the vast world-champion teams have multiple Hall of Famers. In a 60-year stretch, only five teams don’t have Hall of Famers yet. From 1947 to 1980, the 1960 Pirates and ’68 Tigers were the only World Series champions without at least two Hall of Famers elected by the Baseball Writers Association of America. All of the champions with no Hall of Famers or even just one played since 1980, so many of their best players aren’t even eligible for Hall of Fame consideration yet (or are being kept out of Cooperstown because of drug suspicions). Few of the contenders who aren’t automatic Hall of Famers have had second chances yet through the Expansion Era Committee. 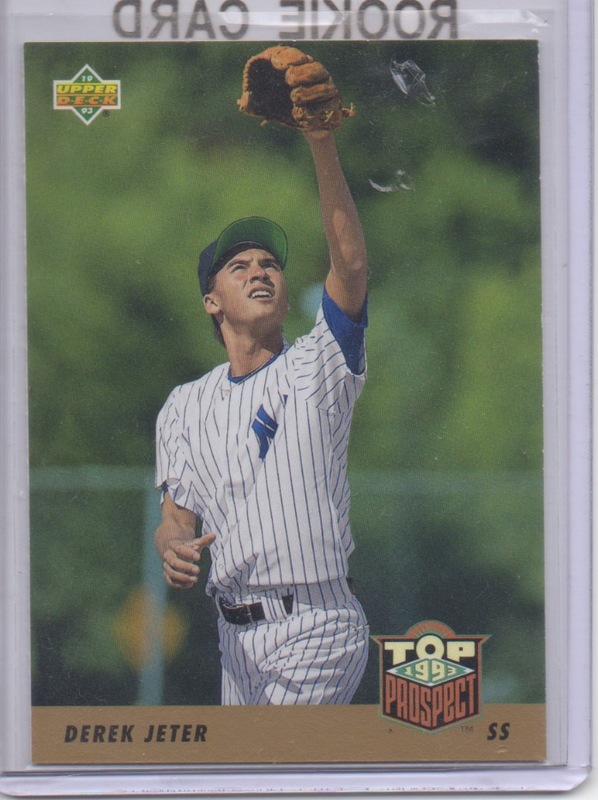 As I noted in yesterday’s post, I expect at least two players from the 2015 Royals to join the Hall of Fame. If I’m wrong, they will be one of few exceptions among World Series champions. Source note: Players’ ages are taken from the Baseball-Reference.com team rosters for the championship years. Derek Jeter was rolling along with another outstanding post-season until he fractured his ankle Saturday night. Now, if the Yankees are going to win their 28th World Series, they will have to do it without either of the sure Hall of Famers who led the way to their last five titles. Mariano Rivera, the best relief pitcher in baseball history, went down for the season earlier this year. Andy Pettitte is the last man standing from the Joe Torre dynasty, but he appears likely to fall short of Cooperstown immortality (especially if the Yankees keep wasting his outstanding post-season starts this year).